If you are what you eat, what should you eat for radiant, healthy and beautiful skin? Skin is the largest organ of the body. The skin, along with hair and nails, is the protective covering of the body. Skin plays a role in maintaining the immune system and helps to regulate body temperature through the sweat glands. Your skin reveals to the world how healthy you are and how old you are. Your lifestyle has a direct impact on how healthy and young your skin looks. Some healthy habits that will have an immediate positive impact on your skin are to cut out vices like alcohol, smoking and eating processed food. Stress is also not good for you. Eating a well-balanced diet helps insure that your body gets all the vitamins it needs to maintain healthy skin. Consuming certain vitamins and minerals is one of the best ways to improve your look and feel of your skin. We list below all the vitamins and ways to include them in your diet to get beautiful healthy skin. And be easy on your pocket too. Let us look at each vitamin in detail. Vitamin A is required for growth, development and renewal of skin cells. The beauty industry calls Vitamin A “retinol.” Vitamin A helps keep the red blood cells and immune system healthy. Vitamin A is also an antioxidant and gives your skin protection against sunburn. Vitamin A evens out skin tone, diminishes fine lines and makes your skin more elastic. It also protects against UV damage and helps keep skin healthy. 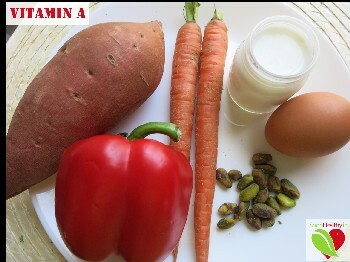 Foods like egg yolk, milk and other dairy products, fish oils, carrots, sweet potato, pistachios and red bell pepper are a few items that are rich in Vitamin A.
Vitamin B has eight different classes of vitamins that all come from different sources and have a variety of skin care benefits. Each class of Vitamin B boasts different skin benefits, but the entire Vitamin B complex helps to combat free radical damage. Vitamin B is required for building red blood cells and immune functions. It regulates oil secretion and prevents extreme oiliness. Vitamin B has a direct impact on your energy levels, brain function, and cell metabolism. You can find Vitamin B in milk, Cheese, Eggs, meat, fish, green leafy vegetables, beets, avocados, potatoes and in whole grains, beans and cereals. Vitamin C is not synthesized by our body and needs to be taken through the food we eat. Our bodies need Vitamin C to make the protein collagen for healing wounds. It helps heal the scars, cuts and bruises. It is also a powerful antioxidant, protecting you from free radicals and possibly lowering your chance of skin cancer. Vitamin C is often included in moisturizers and serums. vitamin C provides a range of benefits, from evening out your skin tone, shielding skin from the visible impacts of pollution, significantly improving hydration, and keeping your skin looking younger, longer. Food that are rich in vitamin C include bell peppers, broccoli, cabbage, brussels sprouts, broccoli, snow peas, cauliflower, kale, sweet potato, asparagus, citrus fruits, tomatoes and berries. Vitamin D is essential for development of skin cells and promote calcium absorption. Sunlight exposure is the primary source of vitamin D for most people. Vitamin D is also known to reduce inflammation on your skin and help with acne. The anti-oxidant present in Vitamin D prevents skin damage and premature ageing of skin when taken via supplements or included in diet. Foods rich in vitamin D include salmon, fortified milk, orange juice, egg yolks, mushrooms and cod liver oil. Vitamin E has moisturizing and healing benefits that help strengthen skin barrier function. Vitamin E allows for the long-lasting moisture retention between your skin cells. It also assists in various kinds of cellular restoration from sun damage to healing support for scars or burns. Vitamin E works with vitamin C help prevent UV-induced damage by rendering free radicals harmless before they can damage cells. The best way to get the daily requirement of vitamin E is by consuming food like vegetable oils, whole grains, almonds, peanuts, and hazelnuts, sunflower seeds, green leafy vegetables and broccoli. Vitamin F, more commonly known as linoleic acid, is an essential fatty acid from the omega-6 family. Vitamin F is essentially a combination of different types of omegas which make up the barrier of your skin. It helps reduce acne while moisturizing the skin. You can find vitamin F in fish oil and health supplements. Vitamin F can also be found in foods like flax seeds, olive oil, fishes, whole grains, walnuts, sunflower seeds and avocado. Vitamin K helps promote blood clotting. Vitamin K works to strengthen capillaries, so your bruises heal faster and make your skin less prone to bruising. Vitamin K helps protect the collagen in the body which helps your skin to appear more, plump, smooth and youthful. Vitamin K is commonly found in green leafy vegetables, broccoli, soya bean, cucumbers, olive oil, soybean oil, cheese, prunes and kiwi. What you eat can have a big impact on your skin health. Eating the right foods can help you age better, both on the inside and outside. Make sure you're getting enough essential nutrients to protect your skin health.